This important election was extensively covered by many climate blogs as Climate Progress, or Quark Soup. Even Pieckle Sr, usually a blog without political content, mentioned USA elections comparing them to Chinese process. And there is where I wanted to arrive, if USA elections were very important for the climate change politics due to many factors,Chinese leadership is not less and has not been covered at the same extent. Both states are the biggest CO2 sources in the world, more than 40% of the emissions between them. And ,although far from the USA in per capita emissions China’s development has made them the leaders in this classification and it is still growing fast. 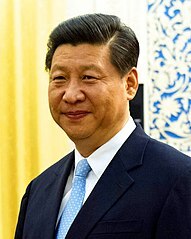 It will not be possible to do something meaningful in climate change without the implication of China, so Xi Jinping¡s ideas about climate change are even more important than Obama¡s and I do not know them. Maybe, next days in COP18 we will start to see. At least I hope so.